Opposition leader Raila Odinga has asked Deputy President William Ruto to stop politicising the ongoing war on corruption. Speaking in Wajir Town during a fundraiser on Saturday, Mr Odinga said what Dr Ruto is trying to do amounts to intimidating investigative agencies in the course of their duty. "We should not allow institutions charged with dealing with graft to be vilified by politicians for doing their work. We must resist it. The country is as good as its institutions, which must be respected," Mr Odinga said. Mr Odinga was reacting to claims by Dr Ruto last week that Directorate of Criminal Investigations (DCI) boss George Kinoti is being used to settle political scores in the name of fighting graft. He asked the DCI to ignore the political noise and focus on his work, saying history will judge him fairly, that it was during his tenure that the country was finally able to tame runaway corruption in government. Dr Ruto's allies, including Senate Majority Leader Kipchumba Murkomen, have been on the offensive, even suggesting that the DCI is not competent to deal with graft cases, and that instead the work should be done by the Ethics and Anti-Corruption Commission (EACC). 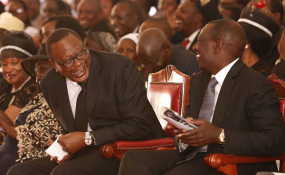 Mr Odinga's remarks will likely give political fodder to Dr Ruto's camp that is already convinced that his handshake with President Uhuru Kenyatta was the genesis of their woes in government. Kericho Senator Aaron Cheruiyot is on record lamenting that they find it difficult these days to meet the President; that the President has met leaders from other parts of the country to listen to their plight except those from the Kalenjin community yet they "are not in government by invitation but by right". Mr Odinga claimed that by accusing the DCI and his team of playing politics, Dr Ruto is hoping to slow down the war on corruption. Mr Odinga at the same time tore into the DP over his decision to downplay the hunger situation in the country. There have been reported cases of deaths in Turkana and Baringo counties due to starvation, Dr Ruto, and by extension the government, insists that no one has died due to the drought ravaging the country. "It is shameful for a leader to deny the truth when people are saying that they are dying of hunger. Such a leader is an enemy of the people," Mr Odinga said. Saying there is no harm in the government telling the truth about the drought situation, Mr Odinga said that when the country witnessed such a calamity in 2009 when he was Prime Minister, they owned up and immediately embarked on mitigation. This week Dr Ruto, together with Treasury Cabinet Secretary Henry Rotich, his counterparts Eugene Wamalwa (Devolution) and Simon Chelugui (Water), announced that some Sh2 billion was being channelled to deal with hunger. He insisted that no Kenyan had actually died due to biting famine in at least 12 counties. This is however contrary to reports from the ground which show cases of fatalities. Dr Ruto has since dismissed the death reports as fake news. Mr Odinga was also in the region to drum up support for ODM candidate Mohamed Elmi ahead of the April 25 Wajir West by-election. Prof Elmi will face off with Jubilee's Ahmed Kolosh Mohamed, whose election was nullified by the Supreme Court. Mr Mohamed was elected on an ODM ticket in 2017. Mr Odinga, invited for the fundraiser by Wajir Woman Representative Fatuma Gede, who is allied to Jubilee Party, said that after the political truce with President Uhuru Kenyatta, they will try to root out corruption once and for all for the benefit of citizens. "We have agreed that no one involved in graft should be let off the hook, regardless of his position in government or in the opposition. They should all pay for their sins," Mr Odinga said. Mr Odinga was in the company of Mombasa Governor Hassan Joho and Suna East MP Junet Mohamed.